👤 This documentation is intended for SQL Administrators and SQL Users. 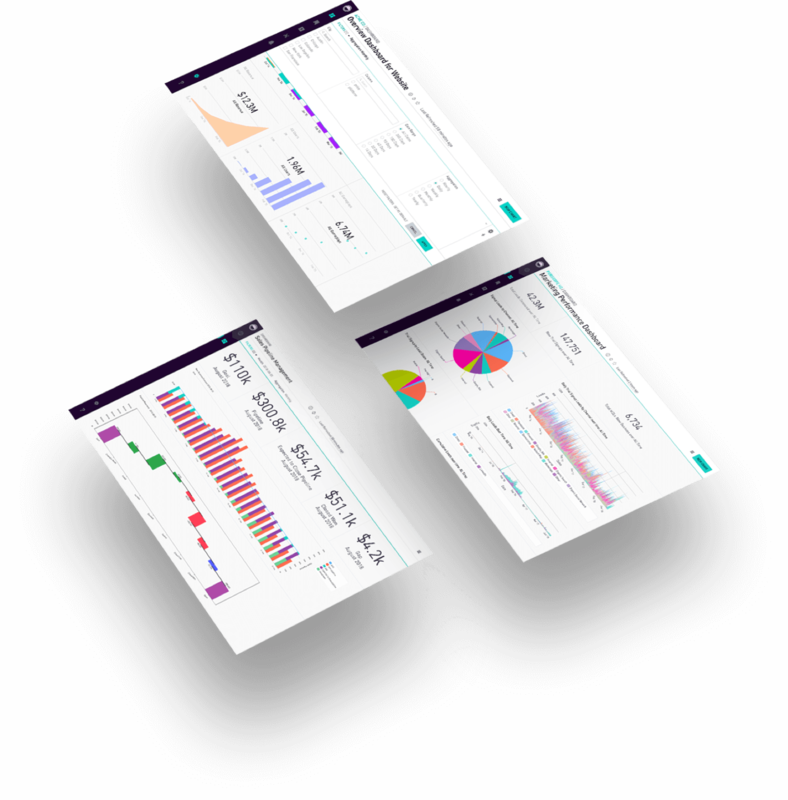 Site administrators have the ability to create new color themes, which SQL users can then implement in reports. 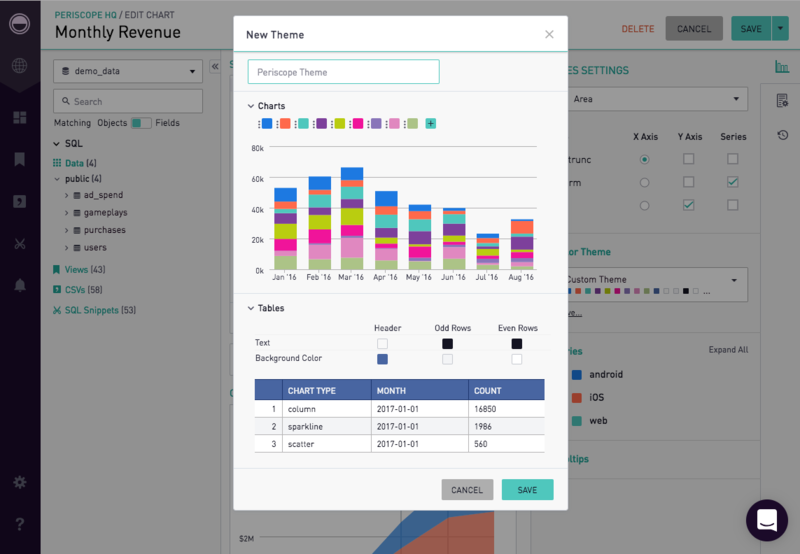 The Color Themes feature allows users to create custom color palettes to be applied at the site-, dashboard-, and chart-level. Note: Color Themes are a pro feature. Site administrators can contact their Account Manager for additional information. 👤 This section is intended for SQL Administrators. To open the Color Themes Menu, first click the Settings menu at the bottom of the left hand navigation bar. Then, click Preferences. At the bottom of the page, admins can add color themes by clicking on the green plus-sign icon. Existing color themes can be edited by clicking on the gear icon to the right and choosing 'Edit'. 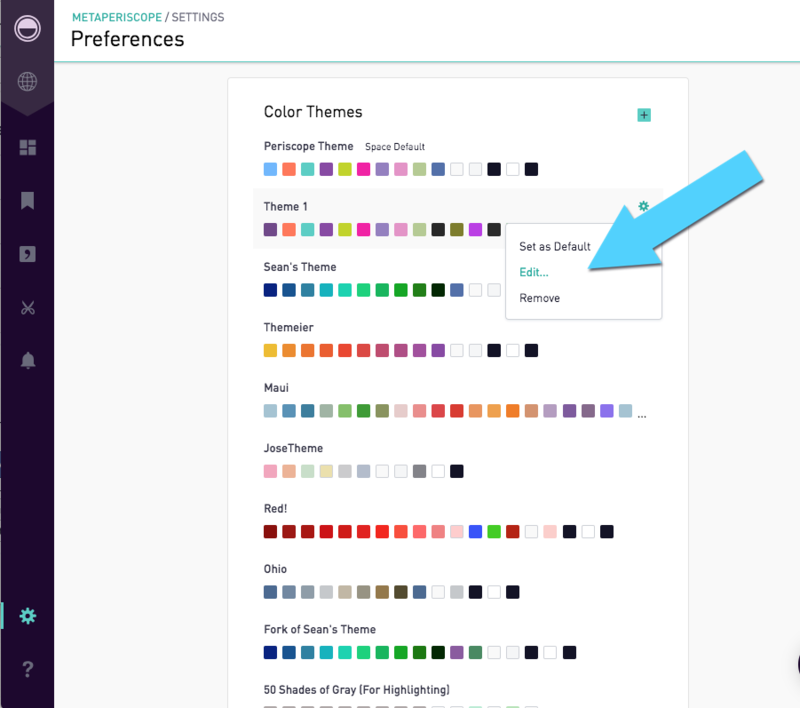 Within the theme editor, admins can add custom colors to the palette by using either the color gradient or entering a hex code. Colors are added to a graph-like chart in the order they appear in this menu from left to right. 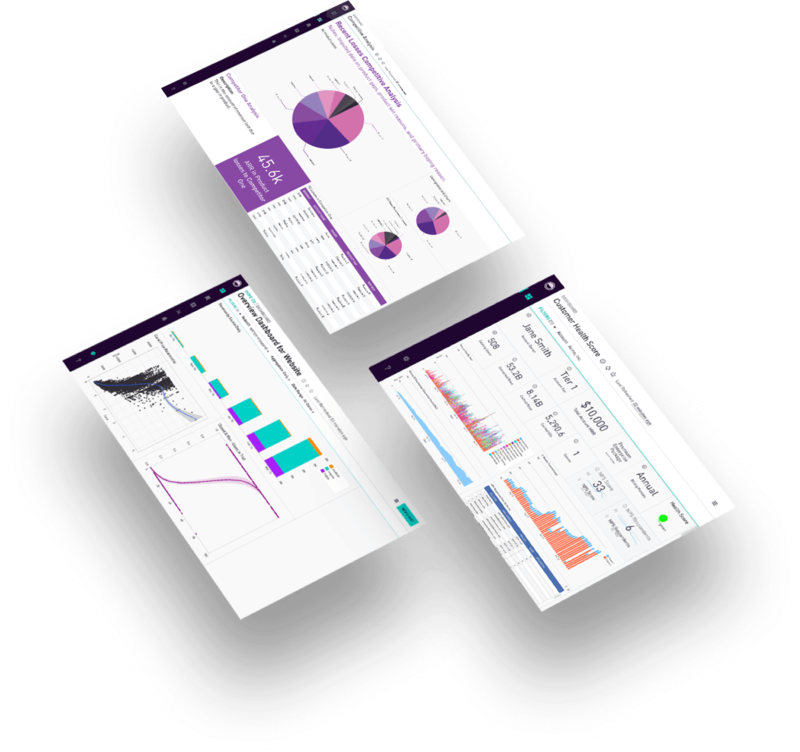 For example, with the theme shown below, the first bar in a bar chart would be colored purple, the second bar would be orange and the third, teal. The order of the colors can be switched by clicking on a color and dragging it to the left or right. 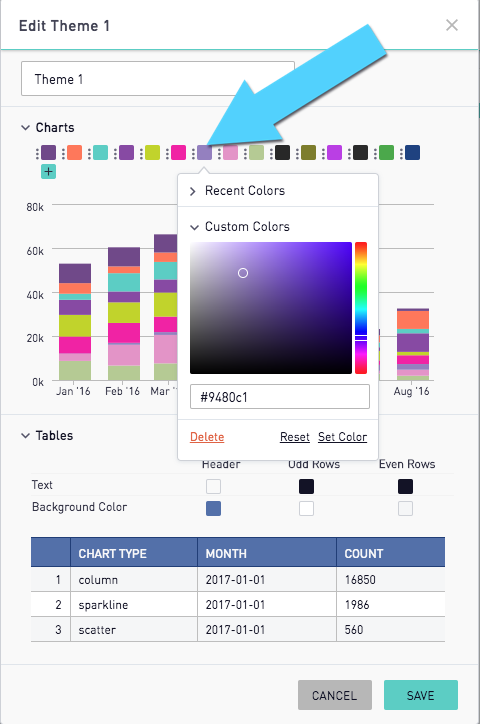 In addition, admins can choose default colors for the text and background colors of table-like charts. After selecting the custom palette, the color theme can be named by editing the box displaying 'Untitled Color Theme'. Once the color theme is saved with its new title, the admin can set the new theme as site default. 👤 This section is intended for SQL Users. 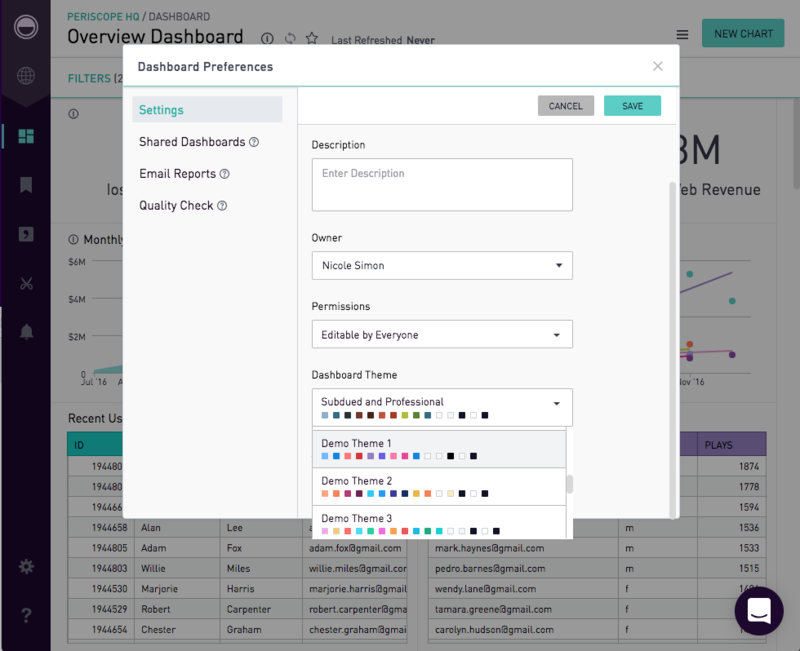 When a new dashboard is created, the site default is automatically applied. To customize which palette is applied to the dashboard, click on the Dashboard Preferences burger icon and click on Dashboard Preferences. 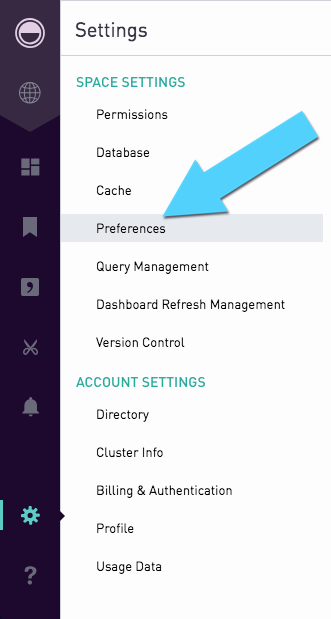 Then on the Dashboard Preferences Settings menu, under the Dashboard Theme dropdown, admins can customize which palette to set as the dashboard default, overriding the default set at the site-level. 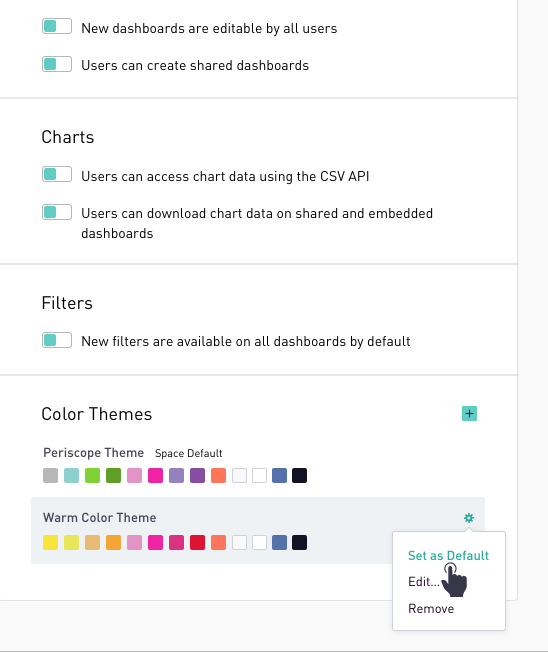 Charts will automatically adopt the palette set in their dashboard settings. 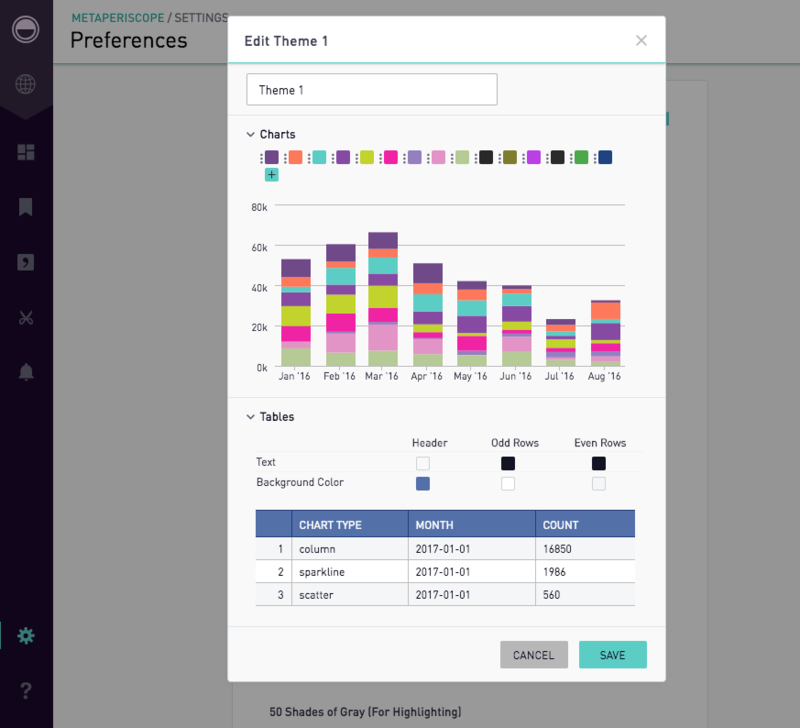 To customize which palette is applied to the chart, users with edit-access can customize the color theme for the chart within the Series Settings under the Color Theme dropdown. Users can also change the individual series color and then can save the new color theme by clicking "Save" in the Color Theme section above. In the pop-up, the user can review the new color settings, set a name for the theme, and click "Save".